When tight on space, small bedroom design is something that many sleepers find themselves dreaming about. With a small room, can you really design that dreamy retreat you’ve always wanted? How can you maximize the space you have available so that nothing is wasted? In this guide for small bedroom design, we’re going to walk through tips and tricks you can use to get a bedroom space that’s big on design, even for small spaces. “Wondering how to select the right size mattress? This can be a bit of a bittersweet compromise when a small bedroom is involved. While larger mattresses are great for stretching out, they can make an already small bedroom look completely cramped. Not all small bedrooms are designed to fit a King-sized bed. Choosing a mattress size that is too large for your small bedroom can make selecting appropriate furniture an impossible task. 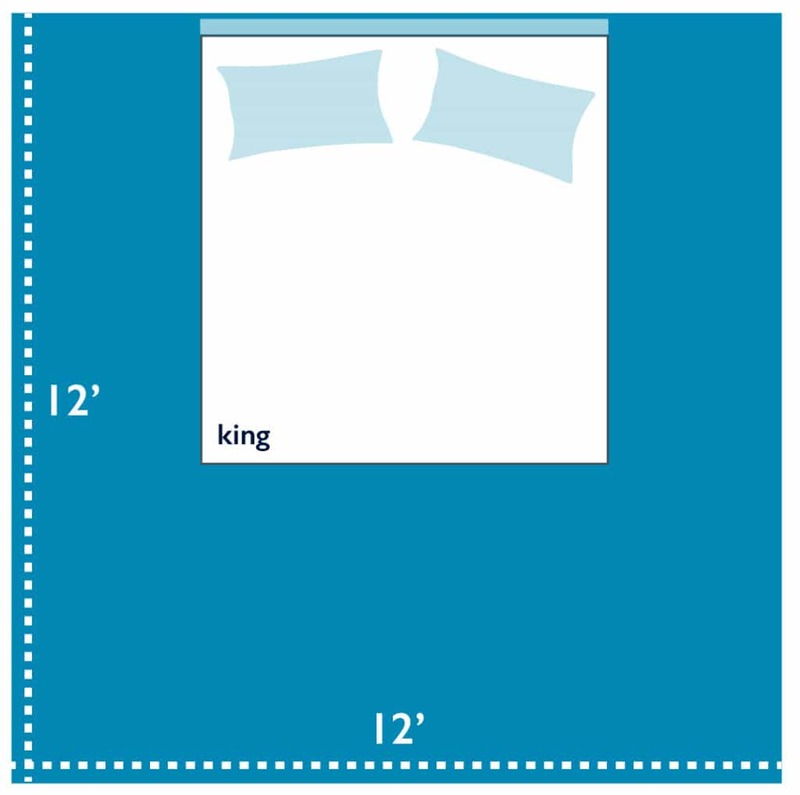 FAQ: What size mattress do I need? I would recommend you save King-sized beds for bedrooms that are closer to 12-14’ wide. Anything less than 11’, I would recommend a Queen size bed. 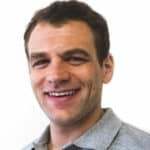 Not willing to compromise on size? Consider a headboard that has a nightstand or shelf built in so you can skip traditional nightstands. Not only will it help to highlight the bed as the feature in the bedroom, but it will also save you the space that a standard nightstand would normally take up. 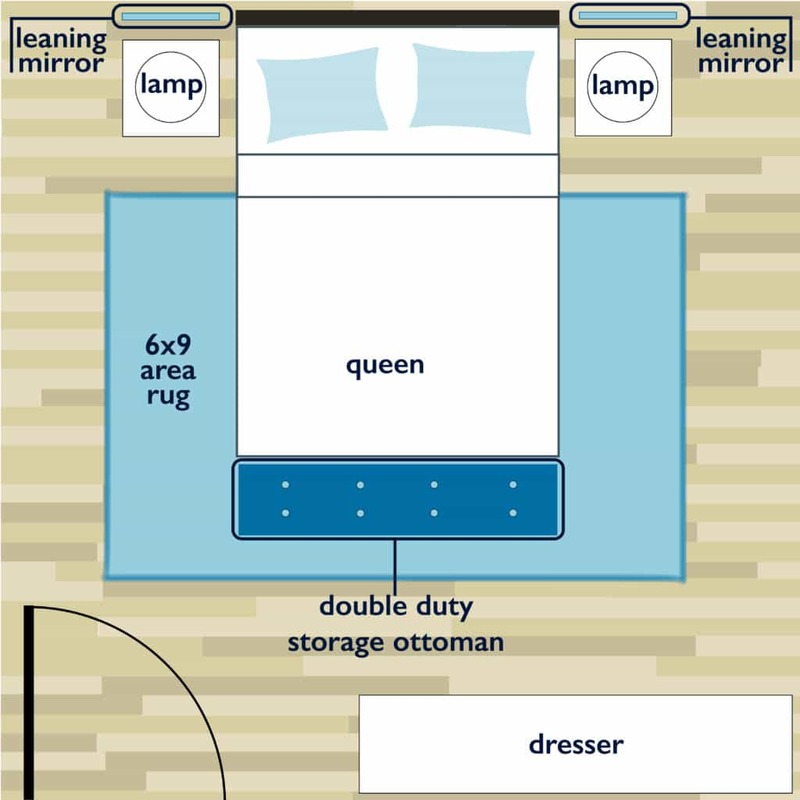 Another option is to relocate the bed to one side of the room, instead of the middle of the room. This strategy creates more circulation, as well as a cozy corner. Keep in mind, for beds with two sleepers, this may make getting in and out of bed a little less convenient. Aside from an appropriately sized bed, another way to make a room appear larger is to take advantage of windows in the room. Avoid dark or heavy shades that limit natural light. Natural light in the bedroom reflects off of the light surfaces in a room (like a white ceiling or bedding) and makes the room appear larger and refreshing. If you like the look of window treatments, consider hanging them higher and wider than the actual window. This designer trick is commonly used as a way to give windows a grand feel and make spaces appear larger than they actually are. For width, you can generally have both panels extending past the window. Height can be as high as you like—even all the way up to the crown molding or ceiling. When hanging long drapes, be sure that your fabric panels touch the ground. This will keep your eyes from breaking up the room, which may occur if your curtains stop a bit short. With small bedroom design, space is limited so keep accessories simple. Utilizing a bold statement piece like a unique headboard, art, or lamp can be a nice way to draw attention to a special item in the room, while the rest of the room’s simple design complements the focal piece. Small Bedroom Design – tip: keep accessories simple. 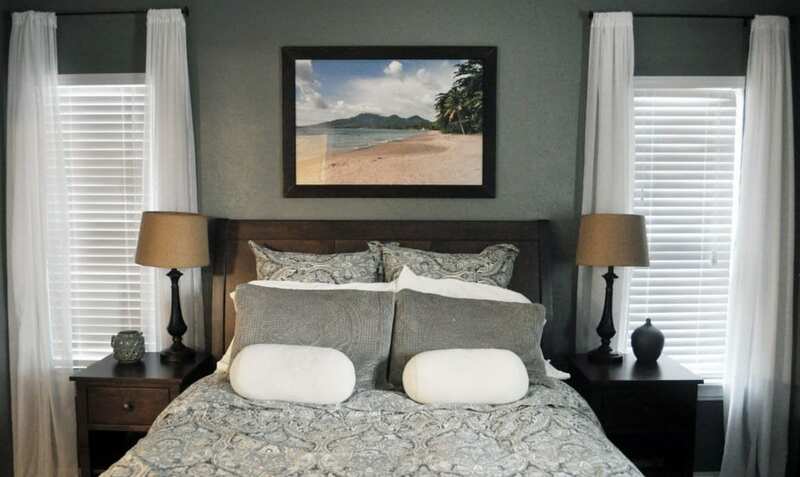 For example, if you have a bold piece of art to hang over the bed, maybe consider a solid-colored comforter and a few accessory pieces throughout the room that highlight colors found in the art. Try to avoid too many eye-catching accents. In a small space, this quickly becomes overwhelming and makes the space look cluttered and busy. Dark paint, bedding, or accessories tend to make rooms feel smaller and closed in. 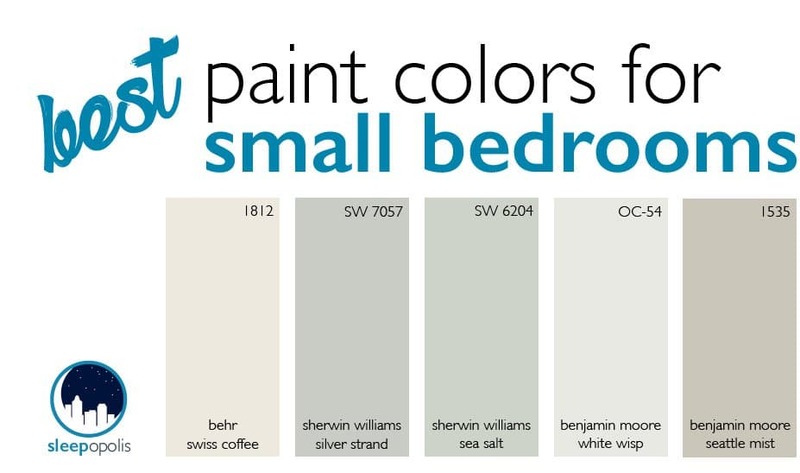 Painting the walls a light color, using light bedding, and selecting furniture with simple lines are a few ways to make your small bedroom look larger. If you like the look of a darker wall (like the room above) contrasting with white accents helps to counteract the darker walls. When selecting furniture, try to avoid heavy-looking wood furniture or bed frames that have bulky headboards or footboards. Considering a sleek iron frame or platform bed will help to make your room look more open and inviting. Knowing how to select a bed frame that is appropriate for your room size is a very important step to achieving a well designed space. In a small bedroom, the bed serves as the primary focal point in the room, so whatever you select is going to have the largest impact on the look and feel of the space. 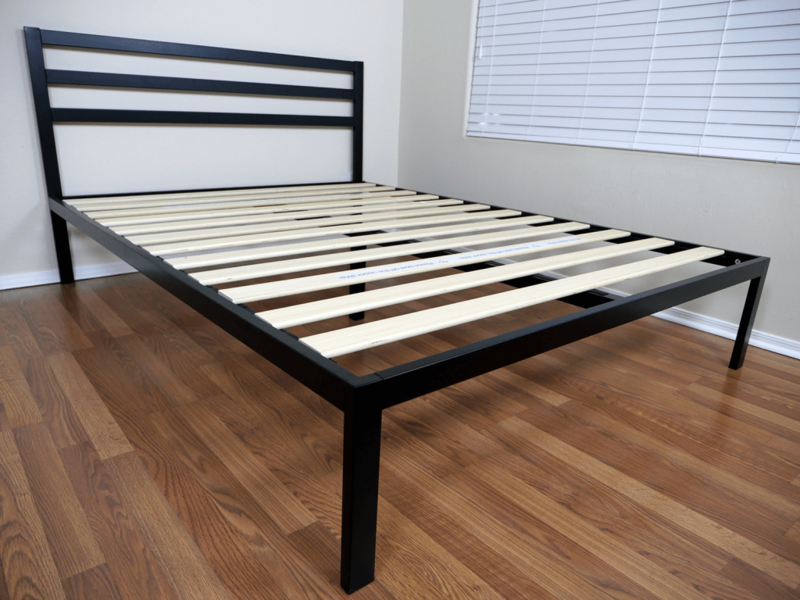 Platform beds are growing in popularity and can make a great bed frame for a small bedroom. These frames typically have simple lines and are low to the ground, making your ceilings appear higher in your small bedroom. 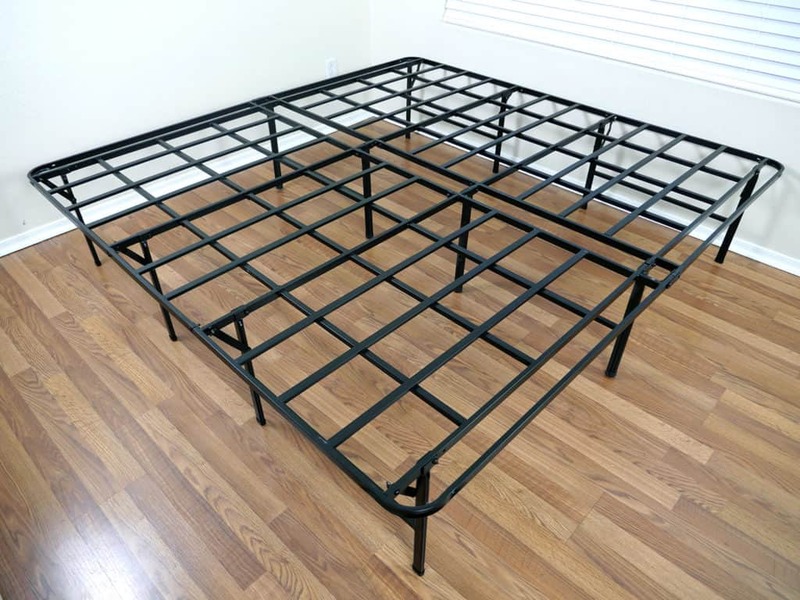 Another option would be a simple metal bed frame. While some metal bed frames tend to take on a more utilitarian feel, like one above from Purple, others are sleeker and may even integrate a metal headboard, like the one below from Zinus. Using a low-profile foundation is another way to simplify the bed and make the ceilings look higher. A low-profile foundation generally is only 4-5” high, versus a traditional boxspring, which is usually twice that. FAQ: Do you need a boxspring? Learn about the different types of foundation options for your mattress here. When space is limited, it’s important to select pieces that can perform multiple functions. Storage ottomans can be nice additions to the foot of the bed, providing a soft seat, storage, and even a pop of color or texture to the space. Wall shelving is also a great way to take advantage of vertical square footage. While nobody wants a “fun house” in their bedroom, adding one to two mirrors may help make the space feel larger. Using tall skinny mirrors above side tables next to your bed gives visual interest to the room without adding clutter. Another growing trend is to lean a large mirror up against the wall, versus the traditional method of hanging mirrors. Not all spaces need to look large and open; some small bedrooms long for a cozy look. In order to play up the cozy factor, consider adding an area rug under your bed. When selecting a rug, be sure that it is large enough to extend past the side and foot of the bed. For most small bedrooms, a 6’x9’ area rug is going to be the best size to make your room feel cozy, but not cramped. 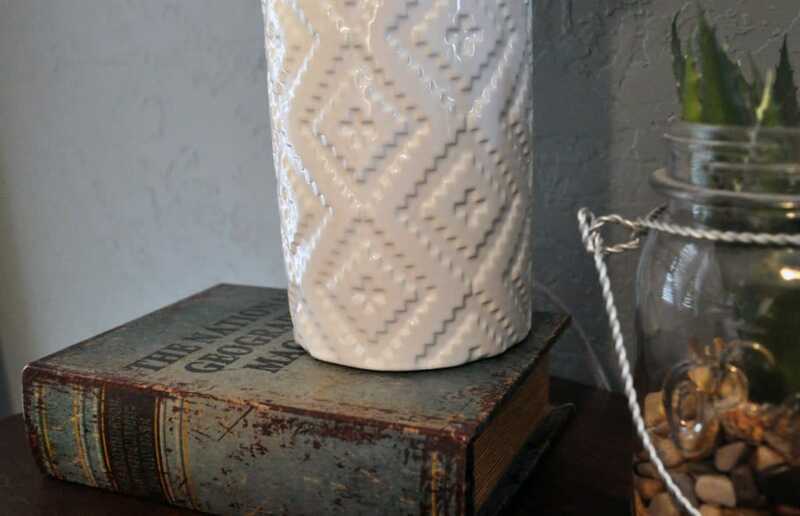 Introducing tactile materials like wicker, flannel, or wool is another way you can make a small bedroom feel quaint and comfortable. When walking that fine line between cozy and cramped, just remember to keep it simple. Statement accents are more impactful if there are only a few of them, so you are not overwhelmed. Overall, there are many ways to tackle small bedroom design. In a small space, it’s important to remember that everything you display or the colors of furniture you choose all have a big impact on how open and spacious your bedroom feels. Limiting clutter, enhancing light, and appropriately selecting your mattress and furniture are just a few ways to make your small bedroom feel larger. Wow… this is a great post. My wife and I are looking at turning a smaller room we have in our house, that we have been using for storage, into a second guest room or reading room. I wouldn’t mind another guest room, as it seems like when family comes to visit there is never enough room. the room in questions is pretty small, but I think we can fit a full size mattress in there and still have a nice amount of room so it will not feel crowded – and look to jammed full of furniture. Cozy is nice, but overflowing with furniture it not so great. Your post gives me some ideas to share with the wife. Thanks, TD! Glad this post could help. It sounds like you and your wife have some good ideas already at how to setup your bedroom. A full size mattress for a guest room is a great way to compromise having a proper guest room setup, while still having enough room for other items / activities within the room for when there are no guests.